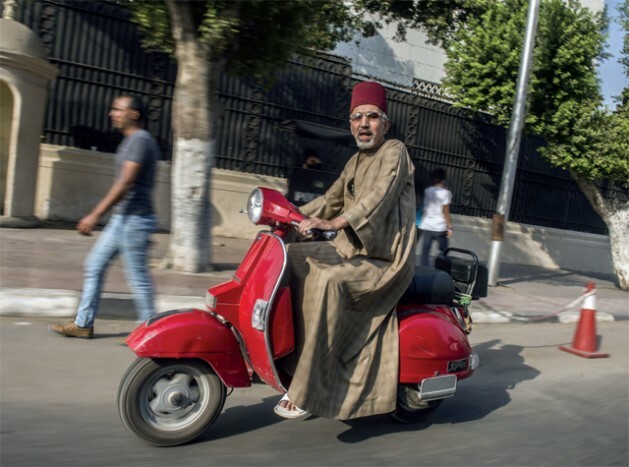 Ugo Tramballi is senior correspondent andcolumnist for the Italian daily Sole 24 Ore.
An Egyptian man riding a scooter and wearing a traditional fez known locally as a “tarboush” in Tahrir square Cairo, October 20, 2015. Apr 1 2016 - Five years ago the Arab world blew up, and the flames are still raging. What at first had been euphoria quickly turned to chaos. What cannot be denied, though, is that the uprisings were the spark of an epochal change. There is no law or decree in Egypt – by now back to a sense of normality – which does not claim to be taken in the name of the January 25 Revolution. This event has created around it a rhetoric in apparent contrast with the real importance of what it would celebrate. But were the events of Tahrir Square really a revolution, or just a student uprising? Whichever way the experts define it, along with the upheavals in the whole region, it is still a question as to whether it was a catastrophe or a historic step for the Arab world. Five years after the Jasmine Revolution in Tunisia, which began in December 2010, and the Revolt of Tahrir Square, which erupted shortly afterwards in Cairo on January 25, 2011, the memory of these events has blurred. Shortly after Egypt, rebellions took hold in Syria, Libya, Bahrain, Saudi Arabia and Yemen. In some countries they turned into civil war, in others they were quickly repressed. The only thing that that everyone seems to agree on is that the Arab Springs – as they were called, imagining them to be something like the Prague Spring of 1968 against the Soviet yoke – have been a failure. The only country spared was Tunisia, but only because it is small, with an educated population, religiously and ethnically homogeneous, and not so geographically strategic as to possesses natural resources that could entice others in the region and the world. Five years after Tahrir, Egypt’s President General Abdel Fattah el-Sisi, formerly a general, has essentially imposed a restoration after a period of unrest and a shortlived government of the Muslim Brotherhood, democratically elected but inept. The Sisi regime is more illiberal than that of Hosni Mubarak, which the crowd had overthrown five years ago: the laws are more repressive, most opponents are in prison, and freedom of the press has disappeared. Any criticism is punished as if it were an act of terrorism against the state. But Sisi has the consent of the majority of Egyptians in search of order and stability. His seizure of power in the summer of 2013, against the Muslim Brotherhood, was a brutal coup d’état in every sense. But it was supported by millions of Egyptians who demanded the military release Egypt from chaos. Elsewhere other “springs” have been a complete disaster. They toppled dictatorial regimes – or, as in Syrian, weakened it – but they did not create democratic forms of government. On the contrary, they have paved the way to anarchy combined with tribal, sectarian and Islamic extremism. Many are convinced that without the great upheaval of 2011, there would be no Islamic State today. It would seem that the dictators of before were better; they managed to control systems and ommunities unprepared for democracy. In short, the riots have shown that the Arab Middle East is not ready, and perhaps never will be, to accept social and political systems that were better than what it had. In some ways, this is a modern form of that old lens full of stereotypes, through which we have always observed the Levant: Orientalism. Yet the facts would seem to support this view. Today there is no Arab country that is better off than it was in 2010. The only one, Tunisia, is a victim of recurring Islamic terrorism that was not as aggressive before the revolution. But all this is true only if you look at the short-term history, following the daily news of a nascent political process full of fits and starts. The French Revolution broke out in 1789: there was the Terror followed by the Thermidor, Napoleon, and the Restoration. European states, enemies and friends of France, took advantage of the uncertainty as today Saudi Arabia, Iran, Turkey and Qatar are exploiting the instability in Syria, Iraq and Libya, as well as the weakness of Egypt. Then there was 1848: the year of European revolutions, which broke out spontaneously and without a common design, resembling the Arab world in 2011. Then came Napoleon III, and only the birth of the Third Republic in 1870 put an end to the process begun by the Revolution 81 years ago. Nowadays television and the internet have accelerated the dissemination of information and increased the volatility ofpolitical developments. But before establishing the futility, or worse, the danger of the Arab Spring, we must look to a time frame outside that of journalism. Dictators who were swept away by the uprisings of 2011 were not the alternative to the Arab Springs, but rather their cause. They prevented the modernization and gradual opening of their civil societies; they refused reforms, transforming economic growth into a gift that the leader bestowed on his subjects; they prevented the consolidation of a healthy relationship between state and religion. Because of them, it was inevitable that sooner or later these countries would explode. It was just a matter of time – whether in 2011, or 2015, or later – before those regimes failed under the crust of apparent social order. If today Tunisia is the only democratic model that has come out of the revolts, then this is mainly because its leader from 1957 to 1987, Habib Bourguiba, was the only Arab dictator to have really modernized his country, creating a school system and giving women a role in society. Yet through protests or with weapons, through a painful political evolution or a tragic bloodbath that still continues, the revolutions of 2011 represent a turning point that the Arab world can no longer avoid. If the French Revolution is the universally recognized barometer for the transition from one historical epoch to another, the Arabs will count their modernity (or post-modernity, if you will) from the Springs.